built-just-for-the-Mac shipping software for printing mailing labels, envelopes and postage. Since 2003, Endicia has been supporting Mac users with an award-winning native Mac application. It’s the only shipping software that’s designed to specifically work on the Mac. That means you can easily print shipping and mailing labels, envelopes and Printable Postage labels right from your desktop. And, you can save time by requesting a package pick up by your Postal Carrier from within the software. Domestic and international mailing labels are generated easily with the correct postage. No guessing or overpaying. Pay the correct postage amount every time. Plus, no more writing out customs forms by hand. Endicia for Mac provides automated, pre-filled electronic customs forms that help you avoid costly mistakes and wasted time. Easily feed one through your printer, it'll come out with the correct postage, verified address and properly bar-coded. Printable Postage: Need a stamp? Try printing your own. Already have a package or letter hand-addressed? You can print your own postage, instantly. Use just like stamps. 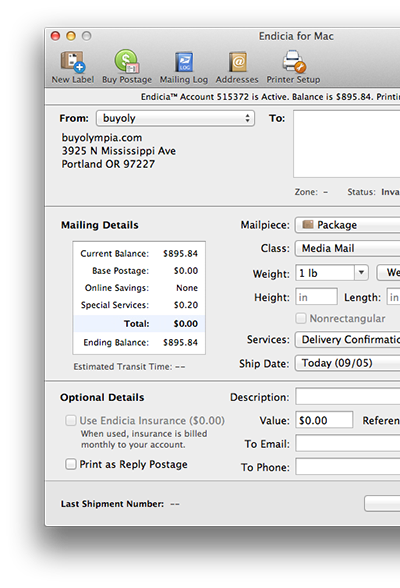 Our Make-Your-Own feature allows you to just type in a postage amount and print. Save up to 69 percent over USPS insurance with Endicia Parcel Insurance. There are no monthly file transfers or extra paperwork. 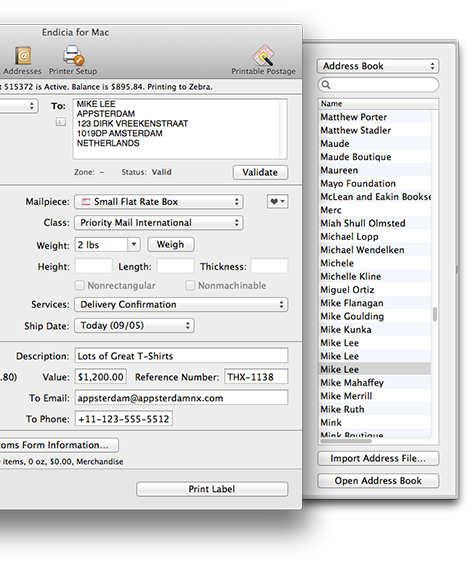 Endicia Parcel insurance is integrated into the Endicia for Mac shipping software. Print similar groups of envelopes or labels with just a few clicks. Our Web Stores support integrates with eBay and Amazon to automatically pull down your order information—and submits the results to the marketplace with just a click. You can also save commonly shipped package types and descriptions in a convenient pop-up for easy re-shipment. Unlike a web-client or a ported Windows client, Endicia for Mac was built from the ground-up as a Mac application. You can access the Apple Address Book right inside the application, and use AppleScript, Watched Folders and XML integration to automate label printing. The unique Endicia URL Type lets you embed postage printing codes in web pages and other Mac apps, making shipping even faster. And our included command-line client lets you print postage without touching your trackpad. The mailing log automatically keeps track of all your shipments. Quickly find any shipment or export to Excel and run custom reports. Using Endicia for Mac shipping software gives you access to better rates than going to the post office, lets you hide the postage amount on many shipping labels, and includes automatic address verification that helps your packages get where they are going, faster. There are no long term contracts, you can cancel any time. *Free trial does not include postage. All of the Endicia applications for Mac are developed in cooperation with the buyolympia corporation.